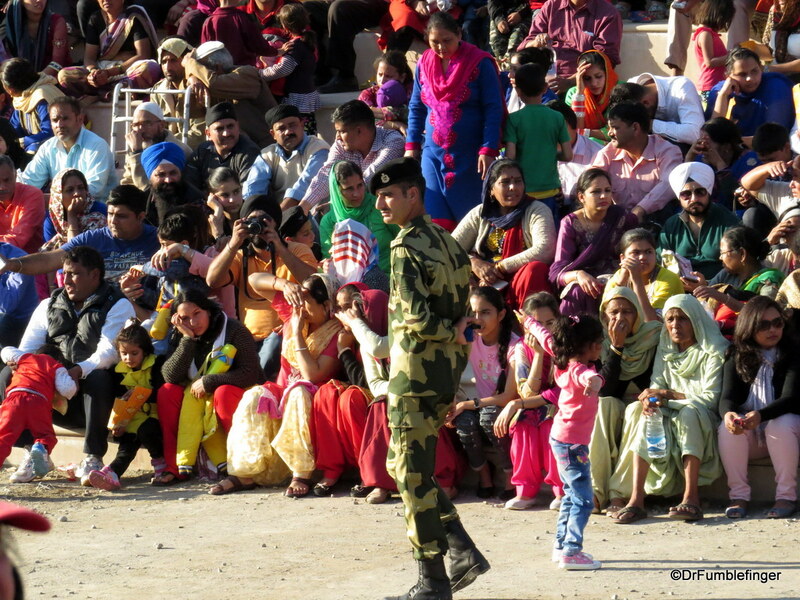 This is a daily ceremony done by the security forces of India (Border Security Force, BSF) and of Pakistan (Pakistan Rangers). It can alternatively be viewed as a symbol of the two countries’ rivalry, or as one of cooperation depending on your philosophy (my perspective was that it was mostly one of rivalry, as the two nations are far from friendly neighbors). 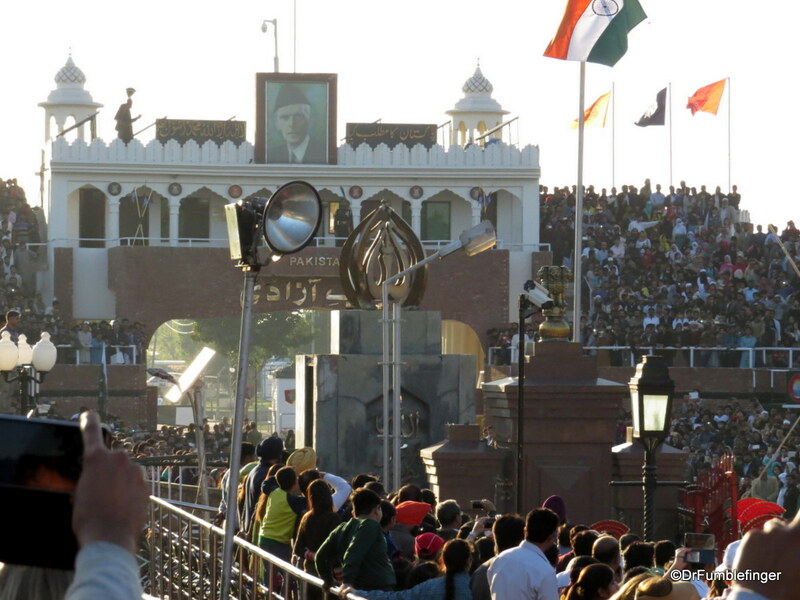 This flag lowering ceremony has been held at Wagah border since 1959 and a similar event occurs at several other border crossings between these two nations. The security at the ceremony is quite tight, partially because a suicide bomber killed over 60 people on the Pakistani side of the border a few years before I attended. No backpacks or luggage are allowed. Screening is thorough, with all purses and such being opened and checked, and everyone frisked for weapons (men frisked by men, women by women). After you’ve cleared this, you’re free to approach the border gates. There are grandstands on both sides of the border which were being significantly enlarged on the Indian side when I visited. Thousands of people were in attendance and there’s lots of cheering for the flags and border guards by participants on each side of the border. Before the actual flag lowering, people (mostly women) ran down the road with the Indian flag, waving and cheering. There are professionals with microphones who whip up the enthusiasm of the crowd and get it roaring and cheering before the actually flag lowering ceremony takes place. I captured some of this energy in a few short videoclips. There even seemed to be a friendly competition between as to which country’s grandstand cheered the loudest. Just before the sun dips below the horizon the ceremony begins. 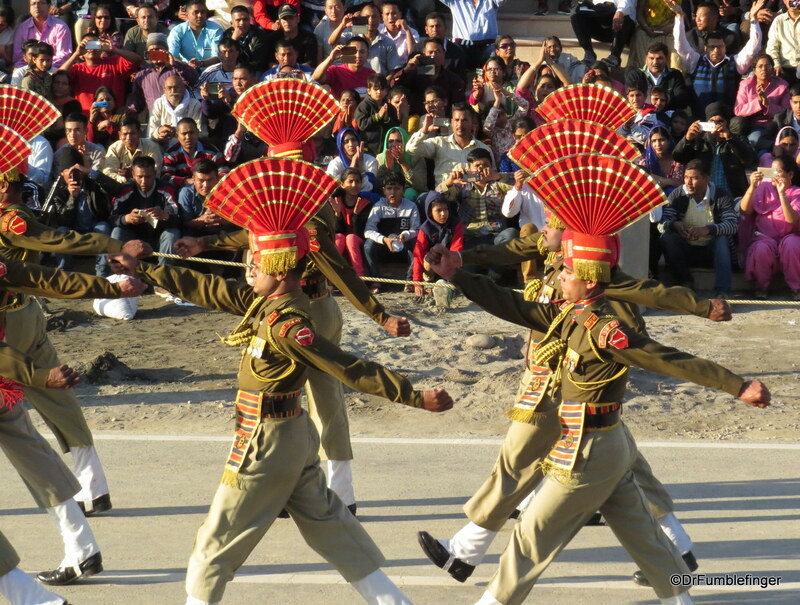 The flag lowering lasts only a few minutes and is characterized by elaborate and rapid dance-like movements by the BSF soldiers and, though I could not see them as well, similar activity was being held on the Pakistani side. The gates between the countries are opened. The lowering of the nations’ two flags is smoothly coordinated after which the flags are folded and carefully moved for evening storage away from the border. The soldiers of this ceremony are specially trained and I was told they’re even paid more if they keep a groomed moustache or beard. After this the gates between the two countries are again closed and locked. The entire thing reminded me of attending a sporting event, although with a more serious edge. Snacks and drinks were peddled, the crowd somewhat loud and rowdy, and as I made my way back to the car I though it had been a good way to end my visit to northeastern India.